Christmas… stuffed cabbage rolls, sausages, sponge cake, eating till you drop on the floor. Or in other cases, just a quick visit to Vienna for some Mulled wine, ginger bread, strawberries in chocolate sauce and walking down the strasse. Merry Christmas, ho, ho, ho, here’s Christmas! But how about a Christmas in a country that’s known to have another religion, far away and warm weather…and still, an Orthodox Christmas? Welcome to Kerala, India!!! KeralaProvinceis the southernmost located province inIndia, right there, towards the inverted corner of the triangle formed by the subcontinent. Over the centuries it was the home country for all spices, this gold mine of the medieval age. Adventurers, conquerors and merchants headed towards the shores of this promise land. Obviously, most of them were from this area – Persians, Arabs, Malays. Some from even further, evenEurope. But the first ones that came already determined to stay and form a foundation for trade were the Portuguese, through Vasco da Gama, the first man who traveled from Europe to Asia by sea, circling around Africa, around theCape of Good Hope. He was searching for spices and Christians. And he had the surprise to find both! The Christian tradition in Kerala goes back a long time, we’re not talking about yesterday, today or 2-3 centuries tops, like the Goa province for example. The first conversions to Christian took place in year 52 A.C., so around 20 years after the crucifixion of Jesus. If the bigger part of the Apostles headed West (well, the mirage of the West existed even in those days), making converts to Christian religion all around the Roman Empire, the doubtful Thomas, a more “alternative” guy otherwise, headed East. And reached Kerala. He was well received here and converted thousands of Hindus, especially from the superior cast of Brahmins. When the Portuguese arrived, the Christians in Kerala had this tradition since more than 15 centuries! Although being one of the smallest provinces in India, Kerala has its paradoxes – it’s the most developed and has the highest literacy levels, yet in charge of the province are the communists, for decades. There is an important Christian community here (formed of Orthodox people, the ones that follow the multi-millennia teachings of the apostle Thomas, but also catholic ones – the Portuguese weren’t happy to find Christians here, even contrary, they found the “wrong” type of Christians, so they started to convert Orthodox and Protestants – the ones left here ever since the Holland colonies – by force with the sword in their hands). Kerala has some impeccable streets, a rara avis in India, great houses, cities well taken care of and a lot of money (for Indian standards). A good part of the Kerala citizens work in the Persian Gulf and sent home billions of dollars. We stopped and visited the entire complex dedicated to the Holy Alfonsa. Saint Alfonsa is the major heroin of this area. She’s a catholic that in spite of her fragile health dedicated her life to the monastic. This happened in the 1940’s. Meanwhile, Alfonsa has been sanctified by Pope Benedict and became the first Indian Saint. Her village became a place of pilgrimage for all the Catholics in the subcontinent. What does it look like? Well, not very different from the way that the Hindu sanctuaries look like – multi-colored statues, bare footed pilgrims but wearing their best silks, market places, people and folks. After the necessary picture taking and visiting all the possible sanctuaries we left toward Thekkady. Thekkady is what they call in Indiaa “hill station”. It’s in the mountains, has a mild climate unlike the sun burned fields or beaten by monsoons, surrounded by hectares of tea plantations. Numerous tourists come here in order to visit the PeriyarNational Parkwhere the guides claim there would be a few dozens of tigers and hundreds of wild elephants. I didn’t see either one or another (the Park does have some hundreds of hectares) but it was a pleasant day for a walk through nature, climbing some hills, taking a ride with a jeep and a boat ride on the lake. It was on a 24th of December, Christmas Eve. There aren’t many hotels in Thekkady, rather guest houses… Our host was an Orthodox, so he was more than happy to find out that we are Orthodox and more than that, we wanted to go to the Nativity Service. He immediately pointed us towards the church. And blew us away when telling us the schedule of the Service – from 2 o’clock at night to 6 o’clock in the morning! “OK, we’ll come at around 5”, I replied…He didn’t seem pleased, but it is what it is…next day we had planned a ride with the elephants and there’s a long way to Madurai. We woke up in the middle of the night and according to the plan, at 5 o’clock in the morning, we were at the church. The streets were empty, only the monkeys were moving around, but despite that, the church was full. Icons just like ours, men on the left side, women on the right, all bare foot – at the entrance of the church were hundreds of shoes and sandals. The service was all in singing – we are in a musical country, see Bollywood! The priests were singing, the women responded, the men were silent.. 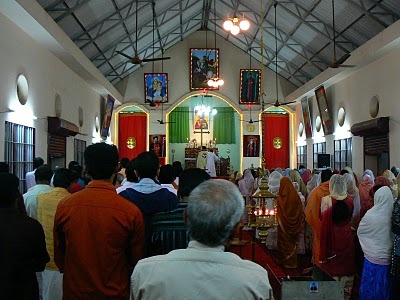 If the icons, the architecture, the whole ambient resembled the orthodox churches, all the rest was from another movie – the Kerala church music didn’t have anything in common with our music, neither the sparkling sari and the bare footed faithful people… The priests looked amazed when seeing us, but the whole gathering didn’t seem to mind our presence. Four years ago, in a village called Moni in the Indonesian island of Flores when we entered a catholic church at a Sunday Service the priest lost all the attention from the people, because everybody was staring at us, forgetting about the service. It wasn’t the case here. At the end of the service, the famous Indian curiosity took over, so we found ourselves surrounded by eager Indians, eager to find out as much as they could about us. We snooped information from them as well and we found out that the Indian Church belongs to all the Churches of the East, it is now run by one East Catholic, the Head of the Church being the 111th Head of the Indian Orthodox Church, the first one being Saint Thomas. It is also called the Syrian Orthodox Church because the links between the Indian Church and the rest of Christianity was permanently maintained through the Syrian Orthodox Patriarchy in Antioch. Also, the weird hours at which the Service took place on Christmas is because of the time difference between India and Syria – practically the service began when it was around midnight in Antioch. I already mentioned Air Arabia. A flight with Air Arabia from Istanbul to Kochi might not cost more than 350 -360 euros, if bought well in advance. FromKochito Thekkady you’ll find numerous buses for a couple of euros. It will take only a couple of hours. Thekkady had numerous guest houses. Beware though the city is very popular among Indian tourists, especially from Tamil Nadu and Kerala that come here to breath in some cooler air especially in the summer time, so it’s good to book ahead. I stayed at the Paradiso guesthouse and it was really ok. The price is 1250 Rupees +15% Tax, that is 21 euros a double room. There are plenty of restaurants in Thekkady with really reasonable prices, most of them with an Indian cuisine, but there are some European ones as well. Don’t miss the Periyar National Park – you can see elephants, you can do some trekking on the hills, you can see water falls, stroll around the lake in a boat. It’s a nice place, but don’t expect to see tigers except the case when you’re really lucky…Other activities you can see on the Paradiso site. Wow, I did not know there are Orthodox people in India. I should now go there some day. How is the best to travel from Greece ? I see only high prices – minimum is 700 euro with Qatar Airways. What you can do is to fly to Istanbul, I guess you might find some cheap prices and take Air Arabia from there via Sharjah. 2 years ago, Air Arabia used to fly to Athens, but, unfortunately, they discontinued the flight. Sounds like a place I need to visit. So many places to go, so many sites to see, so many cultures to experience. I just want to be a walking-sponge.